Every year, in its last issue, Sports Illustrated says farewell to the famous athletes who have died during the year, As I was browsing through this year's "The Farewells" in the Dec. 26th issue, I was struck by the following realization: They're too young to die! People are supposed to die when they're old, not when they're still in their prime. Yet in 2011 so many of these athletes seem to have been snuffed out prematurely. Or were they? Was I unduly influenced by reading the obituaries of five famous athletes who died in their 40s, four in their 30s, and four in their 20s? When they were born, they had life expectancies of just over 70 years. Today, life expectancy for newborns is 78. They shouldn't die so young. So, in the spirit of one who has too much time on his hands, I set to work to test a hypothesis based on my reaction to the Sports Illustrated article: Athletes die younger than non-athletes. This, of course, is a heretical notion. We all know that exercise and sports are good for soul and body. Well, testing benefits to the soul is a more difficult experiment than I can devise. But perhaps I can discern, through an elementary data analysis, whether famous athletes' bodies are at greater risk than those of us more sedentary types. So I went through the Sports Illustrated list of farewells and eliminated the several non-athletes -- agents, writers and such. I did include coaches, because most coaches were active athletes in their previous lives. I was left with 60 famous athletes who died in 2011. And their ages. Their average age was calculated to be 62.5 years (median age: 65.0). As I suspected, they were young. But how young? Well, for starters, much younger than life expectancy is now, and even much younger than their life expectancy was when they were born. But how much younger than, say, a similar-size cohort of other people? Say, famous non-athletes. For this calculation, I went today to the online Times, which, had a list of just over 60 news obituaries -- those of people famous enough for the Times to have written an article about them when they died. The sample I used started with deaths on Dec. 13, 2011, and continued through this afternoon. After culling out several athletes on the list, I was left, coincidentally, with 60 people -- or, rather, former people. The result? 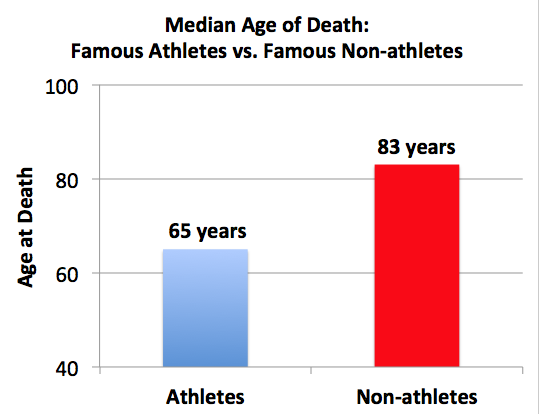 An average age at death for famous non-athletes of 81.3 years (median age: 82.0). Not satisfied with just this one list, I found another compilation in the Times of famous people who died during the entire year 2011. After weeding out the athletes, I was left with 125 obituaries. The results: an identical average age of 81.3 years (median age: 84). This is about 17 to 19 years longer than the athletes' age of death, depending on whether one uses average or median as the measure. Let's call it 18. Famous non-athletes live almost two decades longer than famous athletes. Almost two decades! That's mind-boggling. A small difference would be explainable as within the margin of error. But two decades? There must be some statistical significance. The comparison is even more startling when comparing deaths by decades of their lives, as shown in the chart. In the four decades of their lives, from their 20s through their 50s, a total of 27 athletes died, compared with only two non-athletes. 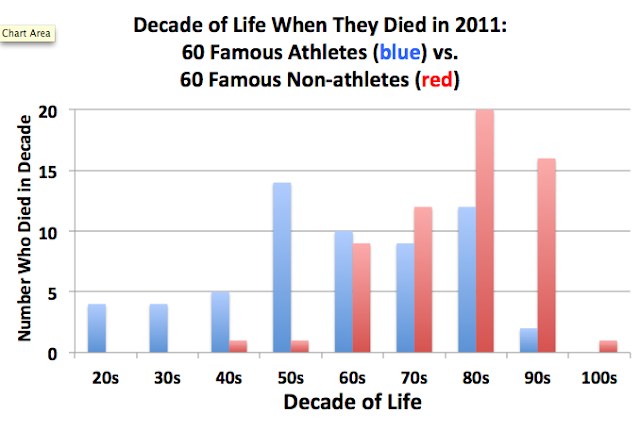 Or at the other end of the mortality spectrum, only two athletes survived until their 90s, compared with 17 non-athletes. I titled this piece facetiously, or so I thought at the start. But maybe it isn't facetious. Perhaps sports at its highest level does come at a price. We now know the impact that contact sports have on hips, knees, shoulders, the back, and other parts of the body, and we also have recently been made aware of the surprisingly high rate of concussions in football and hockey. It's conceivable that there are yet further insults to the system that are the cost of becoming a world-class athlete. Years and years of extended practice and high-level competition may do damage to the body that diminish the famous athlete's lifespan. In any event, my fingers are getting pretty exhausted from all this typing, so I've decided to stop now before I press my longevity luck. One frigid winter day in the late 1970s, I ran into Steve at some meeting in midtown Manhattan, a time and event now long forgotten. What isn’t forgotten is that when the meeting ended and we went outside into the freezing weather, I was reasonably comfortable in my wool overcoat, but Steve was freezing. No overcoat, not even a jacket. I suggested that he buy a coat. He agreed. So off we went to Paul Stuart, my favorite men’s store, just a few blocks away on Madison Avenue. After quickly trying on a few, he picked one. He then asked the salesman the price. Mike Markkula was an Intel product marketing manager when I first met him around 1970. An early Intel employee with sizable stock options and lots of other interests, he retired wealthy in the early 1970s. Mike discovered Steve Jobs at a 1975 meeting of the Homebrew Computer Club. 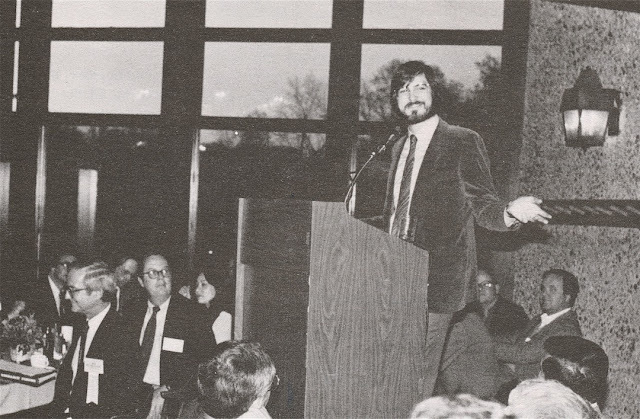 When the two Steves – Jobs and Wozniak – formed Apple Computer in 1976, Mike financed them with a $91,000 equity investment. For this, he ended up with one-third the company. It turned out to be a profitable investment. In late 1977, I recall well two introductions, one product and one personal. Apple introduced the Apple II personal computer, and Mike introduced me to Steve Jobs. Mike and Steve were close, very close, for 10 years. But the friendship collapsed after the well-known 1985 schism at Apple when Steve was fired from the company he co-founded. Since then, as far as I know, the two had no contact. In the spring of 1980, toward the end of my five-year association with Morgan Stanley as a technology analyst, I initiated a meeting that remains indelible in my memory. I introduced Morgan Stanley to Apple Computer. Or rather, I introduced Bob Baldwin to Steve Jobs. For those of you unfamiliar with Robert H.B. Baldwin, let me tell you a little about him. A summa graduate of Princeton, three-sport varsity athlete, Undersecretary of the Navy, member of Augusta National, banker to the Fortune 500, and Chairman of Morgan Stanley – and not to mention, the owner of two middle initials. The epitome of the white-shoe Wall Streeter. In other words, the un-Steve Jobs. The occasion for their meeting was a computer show being held at the New York Hilton Hotel, just three blocks north of Morgan Stanley headquarters on Avenue of the Americas. 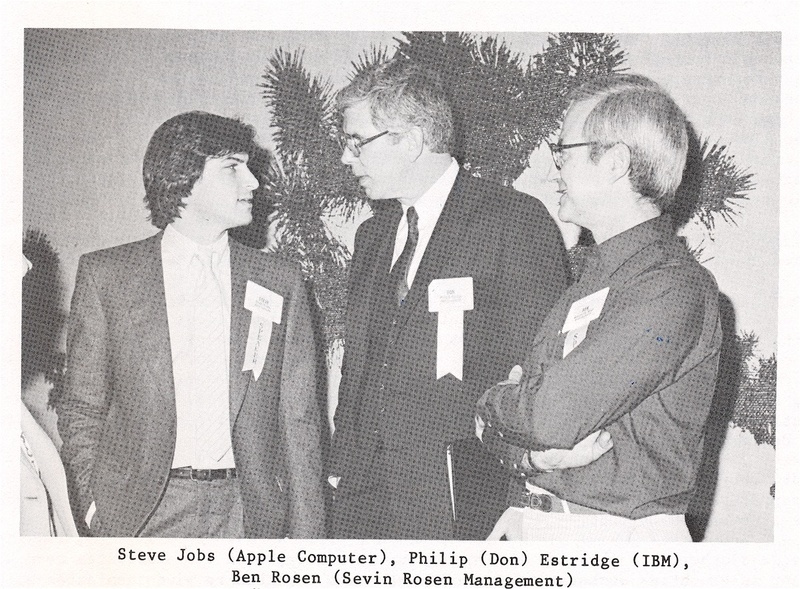 Apple was exhibiting its modest product line, the Apple II and Apple III, and Steve was manning the booth. Morgan Stanley at the time acted as investment banker only for the crème de la crème of American and international business: AT&T, General Motors, DuPont, General Electric, IBM, Merck, Standard Oil, et al. No pipsqueak start-ups for them. But the winds of economic change were being recognized even in the hallowed halls of Morgan Stanley. There were some in the firm who perceived that the second industrial revolution – information technology – might soon create some major new industries, new companies, and new investment banking opportunities. After what must have been a lively partners meeting in early 1980, the firm decided to compete for underwriting the forthcoming Apple IPO. And who better to sell the merits of Morgan Stanley than Bob Baldwin? Well, as it turned out, maybe others would have been better. Nonetheless, Bob is the partner I took to meet Steve Jobs. My role? For the three preceding years, I had been the self-anointed evangelist of personal computers in general and Apple in particular on Wall Street and at Morgan Stanley. I used to take my Apple II on visits to clients, trying to demonstrate that this playful-looking product had a potential far greater than its then perception as a toy for hobbyists and gamesters. But Morgan Stanley was a particularly tough sell. Before they would approve purchase of an Apple II for me (so I wouldn’t have to cart the one Apple gave me between home and office), I had to prove to the IT department that a PC could do something that their mainframes couldn’t do. So I did. And it took just one demo. In a meeting before the IT staff, I opened a beta version of VisiCalc, the world’s first practical spreadsheet. It was a new application just created by Dan Bricklin and Bob Frankston that was available only on PCs (and initially, only on Apples). I populated the rows and columns with a financial model (something that bankers could understand), changed the value of one cell, then hit the recalc key. The value of every cell in the worksheet was instantly recalculated. “Wow” resounded throughout the room. They had never seen anything like this before. Their resistance melted, their approval was given, and a Morgan Stanley check was cut to purchase one Apple II for me. Thus, I became the designated go-between. Baldwin and I walked to the Hilton, ascended the escalator to the ballroom floor, where trade shows were domiciled, and headed directly to the modest Apple booth. For the next 20 minutes, the following weird situation took place: Steve engaged in a monolog about how insanely great the Apple PCs were, and simultaneously Bob delivered his own monolog of why Morgan Stanley was the nonpareil banker of the financial world. Neither seemed to listen to, nor care about, what the other was saying. Steve had no clue about investment banking, and Bob’s total knowledge of computers was that Morgan Stanley had some. Yet strange as this dialog between monologists was, somehow Morgan Stanley ended up as the lead underwriter. Apple went public in December, 1980, and the rest, as they say, is history. Incidentally, intoxicated by the success of the Apple offering, Morgan Stanley modified its historical big-company strategy and went on to become one of the leading technology bankers, a leadership position that continues to this day. After dinner, someone who looked like a demure orthodontist, with thinning silver hair and owl-eyed spectacles, performed what, in computer circles, amounted to a cabaret act. The figure wearing a Mac T-shirt over a long-sleeved dress shirt was Ben Rosen. He had turned a reputation gained as a Wall Street electronics analyst, the industrious publisher of an informative, sprightly newsletter, and host of annual personal-computer conferences into a career as a venture capitalist. Before he started investing in computer companies his comments had been sought as much as his ear. “IBM already said they weren’t for sale,” Randy Wigginton, a young blond programmer, shot back. Curious, I flew to the Bay Area, and met Steve at an Indian restaurant in Menlo Park. It was a haunt of his; he could always get great vegetarian meals there. After we finished with the amenities and reminiscences, we got to the purpose of the meeting. Steve wanted Compaq to offer the Apple operating system on its PC line, adding to the Microsoft OS that had always been our sole OS. At the time, Compaq was the world’s largest manufacturer of PCs. Our adopting the Apple OS would be seen as a feather in Apple’s cap (and a pretty visible slap at Microsoft). The catching up with Steve was fun, the food was great, but the OS idea never gained traction. Upon further analysis, it didn’t make sense for either Compaq or Apple. Compaq wasn’t about to declare war on Microsoft, our partner from our birth in 1982, and Steve had second thoughts about licensing their crown jewels. The Western Electronic Manufacturers Association used to hold annual industry conferences in Monterey. 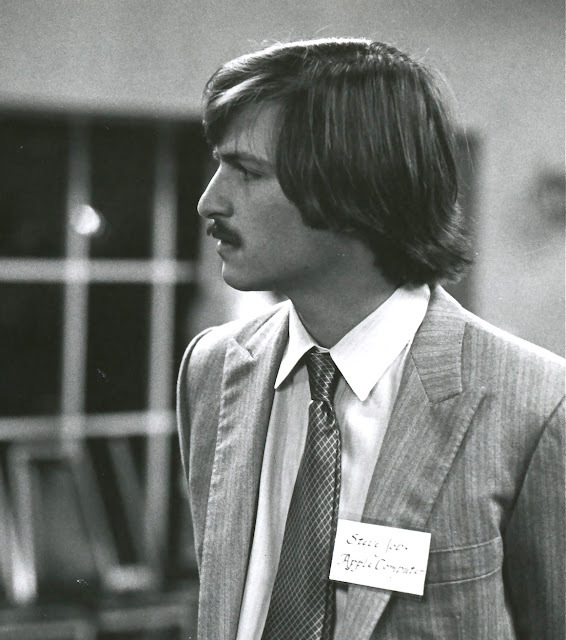 Steve keynoted one of the conferences in the early 1980s. But rather than tout the greatness of Apple, or the potential of personal computers, or anything material or mundane , Steve spoke passionately for 40 minutes on one subject -- the dangers of nuclear warfare. That was it. The audience, needless to say, was dumbfounded. Steve spoke, took no questions, and sat down. Steve, it turns out, had a lot of passions. In 1979, the year before Apple went public, Mike Markkula called to offer me the opportunity to buy $1 million worth of Apple stock. I thought about it, considered it, and ultimately declined. Why? I felt it would compromise me. Even though Apple was a private company then, I was writing about it regularly in my capacity as a securities analyst. I knew it would soon become a public company. As such, I felt that meaningful stock ownership would affect my judgment on the stock. In retrospect, I was somewhat over-cautious. Indeed, judging by the ethical standards of Wall Street of the last decade, I must look like some kind of nut. So what did I forgo? Apple stock is up about 150 times from its IPO price, adjusted for splits, and maybe 500 times from the price I was offered. But, in the words of Edith Piaf, Je ne regrette rien. The year is 2007. Steve Jobs is now on the top of the world. He had created or transformed at least five fields -- computers, music, animated film-making, telephony, and industrial design. In June 2007, I decided to email him after having had no contact for eight years. I just wanted him to know that I had happily returned to the Apple fold after two decades in the desert. I didn’t expect a reply. A few weeks later, to my surprise, I did receive a response. I was touched to hear from him, and touched by what he wrote. Sorry for my delayed reply - I was on a much needed family vacation for the past three weeks. Wow - this news makes my day! I'm glad to hear it. I hope you like what we've done with the Mac. I'm biased, of course, but I think its light years ahead of Windows. How are you doing? We haven't seen each other in years, but I remember the times we spent together very fondly. It gives me a great deal of pleasure to think that on August 1, 2007, I made Steve Jobs’ day. We invaded Afghanistan ten years ago. We’re still there. Why? Why do we pump in $130 billion per year into a government that has a $1 billion budget? Why do we mismatch our priorities with our resources? Why are we so perpetually optimistic? There is no one better to answer these questions than Rory Stewart. I first wrote about Stewart in January 2010. A remarkable person with an equally remarkable background (British military, foreign service, best-selling author, deputy governor in Iraq, manager of a Kabul foundation, Harvard professor – and all in his 20s and 30s), Stewart was elected to Parliament in the Tory victory last year. “Vera Stark” involves racism in Hollywood over a 70-year period -- 1933 to 2003. 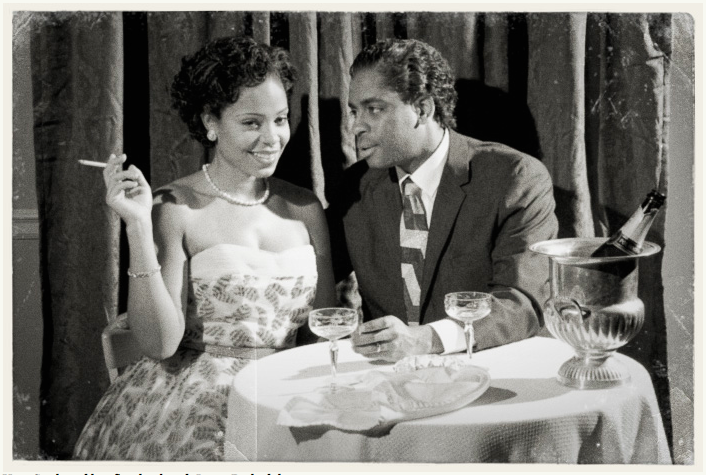 In the thirties, black actors were relegated to only the most menial roles in movies. 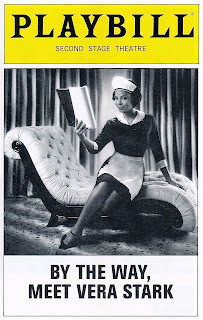 But Vera Stark was not satisfied with her debut role as a maid in “The Belle of New Orleans.” And therein lies the starting point of the play. Without giving anything away, during the succeeding decades Vera’s roles, and Vera herself, change radically. Now it’s probably true that you didn’t wake up this morning and say to yourself, “Tonight I’d really like to go see a play about racism.” But you should have, because “Vera Stark” manages to take a serious subject and, through wonderful writing, acting, direction and set design, transform it into a funny and rewarding experience. The seven actors, playing a dozen roles, are uniformly engaging. And the abrupt change in the tenor of the play from Act I to Act II is as startling as that in “Sunday in the Park with George.” Nottage’s writing is impressive – examples that stick with me are a flirting scene that’s perfectly executed, a hilarious put-down of academic pontificators on talk shows, and a movie-within-the play that could stand on its own. 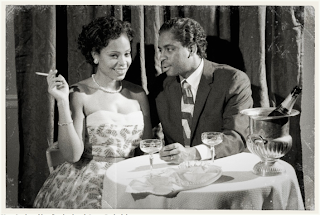 Not least of the attractions is the intimacy of watching marvelous talents in a 299-seat theater. Should “Vera” eventually move to Broadway, and it well may, let’s hope it doesn’t lose its impact by playing in a much larger house. After you’ve seen the show, watch the following quasi-serious eight-minute video by Herb Forrester, who’s created a remarkable documentary about Vera Stark. Wait a minute. A documentary? Does this mean Vera Stark is real? Was there actually a 1933 movie entitled “The Belle of New Orleans”? Or is this a send-up of the show? Or all the above? See the show. Watch the video. Then you decide. Of course you can watch the video now, but it’ll make more sense after you’ve seen the play. 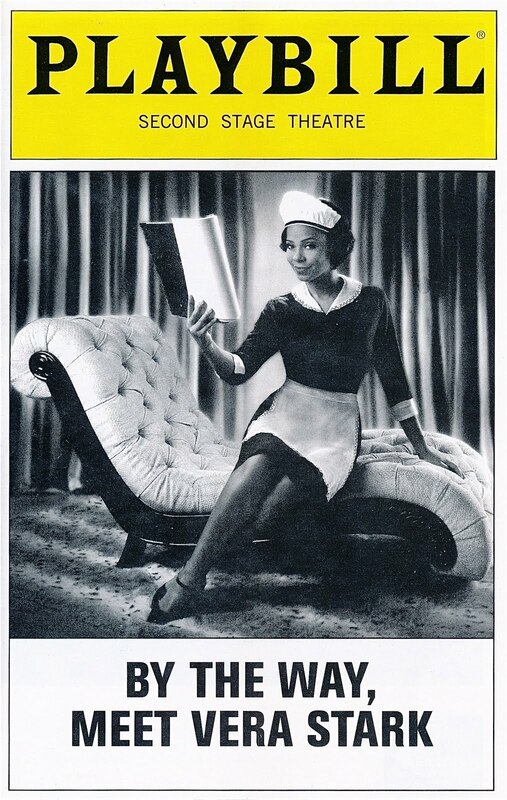 By the way, “By the Way, Meet Vera Stark” closes May 29, so hurry. There I was yesterday morning, drinking my coffee and reading the latest about Libya in the New York Times and the Wall Street Journal. Something was bothering me. And then it struck me. The two papers spelled the Libyan leader’s name differently. One started his last name with a “G” (the WSJ), the other with a “Q” (the NYT). Moreover, the Journal inserted an “h” into his name, the Times didn’t. Gadhafi vs. Qaddafi. The Times, of course, often has some differentiation, occasionally arcane, in its style manual. For example, in any article about Libya, the leader's first mention is different from later mentions. The first is always Muammar el-Qaddafi. Subsequent ones are Colonel Qaddafi. (With the latter name, you might say the Times got the el out of there). Do other papers share this spelling inconsistency? I poked around a little, checking the Libyan leader’s spellings in a variety of other U.S. and foreign publications . It turns out there is very little agreement among them. Montreal (Gaddafi) differs from Toronto (Gadhafi). Germany (Gadhafi) differs from France (Kadhafi). Surely there must be agreement among the Arab-speaking media? But no. Tripoli (Al Qathafi) differs from Al Jazeera (Gaddafi), and both differ from OPEC (El Qaddafi). Only in Britain is there some spelling consistency, which strikes me as odd. Normally, the British papers aggressively go after each other tooth and nail, and rarely collaborate on anything. Yet here they are apparently having got together and agreed upon a common spelling. The BBC, Guardian, Financial Times, Daily Telegraph, Daily Times, Independent – even Number 10 Downing Street -- are of one spelling (Gaddafi). Only the The Economist goes its own way (Qaddafi). But, then, The Economist often goes its own way. Now here is either the most amusing or the most discouraging part of this story. Getting our foreign policy consistent among our various government departments and agencies is understandably difficult. Rare is the time that the President and State and the CIA are on the same page on policy. But why should it be so hard for them to agree upon a common spelling of one of the world’s really bad guys? Apparently it is. Otherwise, why would we read about the White House railing against Gaddafi when Sec. Clinton is threatening Qadahfi? Meanwhile, the CIA World Factbook likes to refer to him as Col. Muammar Abu Minyar al-Qadhafi? And so far we’ve only been talking about his last name. As to his first name, you have a choice around the world of five spellings: Muammar, Mouammar, Moammar, Moammmer, and Moamer. My guess is that instead of consulting the OED or Wikipedia or a library information desk (remember library information desks? ), the media and governments around the world instead randomly combine the five first-name possibilities above with the eight last-name spellings -- Al Qathafi, Al-Qadhafi, El Qaddafi, Gaddafi, Gadhafi, Kadhafi, Qaddafi, Qadhafi. The result is 40 possible permutations of a first and last name. They then pick one of the 40 out of a hat, and that then becomes the name of the Libyan leader. No wonder getting our foreign policy right is so tough. Maybe we should start with our spelling, and work up from there. OPEC - Colonel Moammer El Qaddafi. Last night, 19,763 sports fans paying hundreds to thousands of dollars for tickets jammed Madison Square Garden to welcome all-star Carmelo Anthony as a new member of the New York Knicks basketball team. The Knicks won. Also last night, a few hundred students (paying nothing) attended the Caltech-Occidental basketball game at Caltech’s Braun Athletic Center. Caltech won. 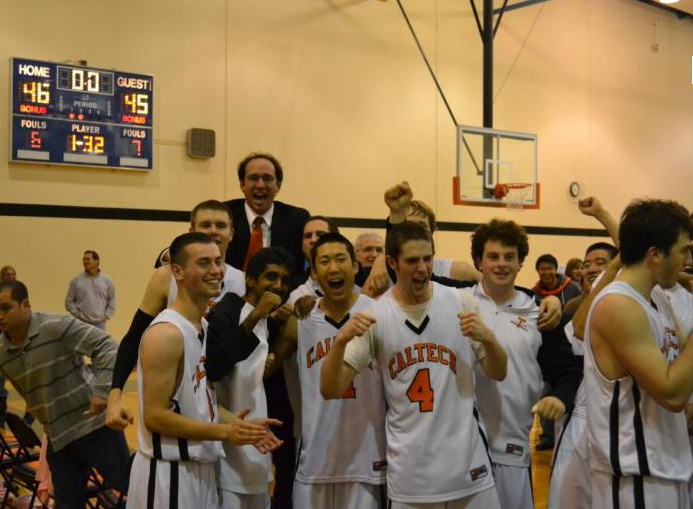 Caltech’s victory came despite the fact that President Obama attended Occidental for a couple of years, and he probably picked them to beat Caltech. But he had no more prescience in this game’s outcome than he did in picking the Bears to win the Super Bowl. Caltech still won. There are some who think that the Knicks game was more worthy of national attention than was the Caltech game. Indeed, judging by the comparative press coverage (about 1,000 to 1 in the Knicks's favor), attendance (about 100 to 1), and ticket prices (infinite ratio), the Knicks seem to hold the zeitgeist edge. But judging by historical implications, it’s Caltech all the way. 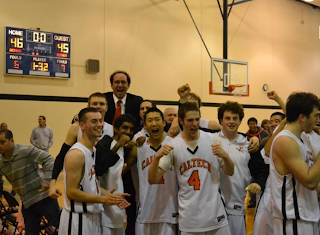 For the first time in the last 26 years, Caltech won a conference basketball game. 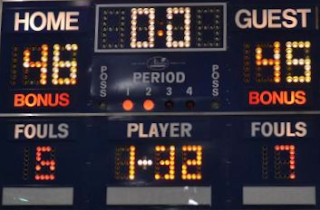 A record 310-game losing streak – longest ever in the United States by any sports team – was broken. Like so many of its achievements in science and technology, Caltech accomplished something that no one else in history has ever been able to do. Havoc broke out in Pasadena. Nobel laureates raised toasts to the winning athletes. 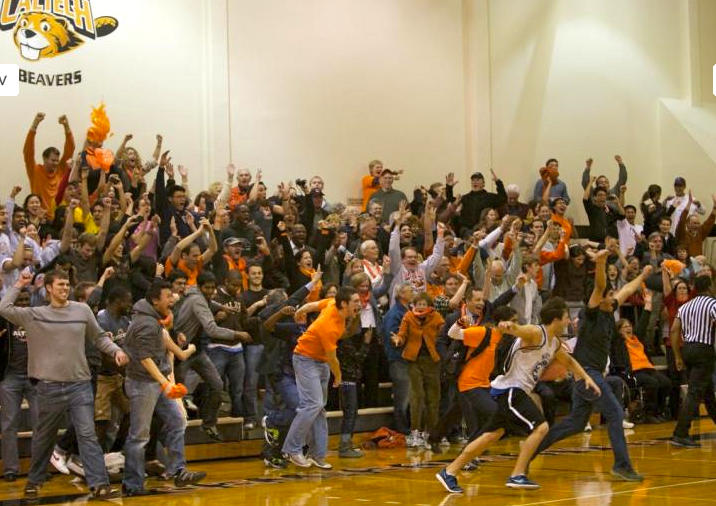 Students interrupted their problem sets to cheer a sports team. Even The New York Times featured Caltech, not in the Science section, but on the second page of the Sports section. This indeed was a Big Event. So here's my question: Is winning the only thing? If so, Caltech should have been completely embarrassed over the last 26 years. The school should have buried its collective head in shame. Losers, losers, losers. So team, enjoy your victory. But remember, keep having fun. CLASSICAL MUSIC ECONOMICS: IS THERE A SOLUTION? The Detroit Symphony, which has just emerged from a 34-day musician’s strike, is in such economic straits that it may have to disband. The management of the debt-burdened Detroit Symphony Orchestra canceled the rest of its season on Saturday, after executives and the players failed to resolve a strike that has lasted four and a half months. Time magazine’s piece over forty years ago described the entire classical music industry as being in mortal peril, and not just in Detroit. Indeed, the death of classical music is a perennial topic, yet somehow orchestras have persevered. Should we be any more worried today than we were in 1969? Is the Detroit Symphony’s dire situation a one-off phenomenon, or is it part of a larger problem affecting classical music organizations throughout the United States? Clearly, there are extenuating circumstances in Detroit. This once-proud centerpiece for American manufacturing has been in a four-decade economic tailspin. One measure of the decline: its population has fallen from 1.5 million in 1960 (No. 5 in the U.S.) to 900,000 now (No. 11). Unfortunately, Detroit is not alone as far as its orchestra’s turmoil is concerned. There are myriad other indications that classical music is in deep trouble financially. Recent press articles have cited financial issues with a host of other orchestras. Most American orchestras are operating at a deficit – and that’s after philanthropic contributions. Indeed, income earned from ticket sales usually accounts for less than half the operating budget of a musical performing arts organization. Even selling out the house doesn’t solve the problem. Those orchestras lucky enough to have endowments have been eating into them to meet operating expenses. And, unlike European arts organizations, which are heavily subsidized, American groups get essentially zero financial support from federal or local governments. There are at least two exceptions to this bleak outlook. The Los Angeles Philharmonic and the Boston Symphony have the luxury of owning cash cows that enhance the orchestras’ financial situations. In L.A., it’s the very profitable Hollywood Bowl, and in Boston it’s the highly successful Tanglewood summer festival. But outside of those two orchestras, it’s difficult financial sledding for the other majors, and worse for the smaller organizations. Well, there is one scenario that could be a harbinger. It’s not a pretty scenario, but it’s one that has allowed a once-proud but financially strapped orchestra to survive. In the early 1990s, after six decades of performing, the New Orleans Symphony ran out of money, donors and time. It went bankrupt. In its ashes, the Symphony’s musicians got together and created the Louisiana Philharmonic, the nation’s first musician-owned and –operated orchestra. The musicians run the organization, control the board, hire and fire, raise money, and pay themselves. And therein lies the rub. In order to survive as an orchestra, they pay themselves astonishingly little – an average of $23,000 per year. A little over $10 per hour. Pretty frightening, no? There’s no easy answer. The musicians want not just a living wage, but one also reflecting their talent, years of training, and status as being among the elite musicians in the country. Management wants a solution that reflects the exigencies of a virtually bankrupt organization. As the Detroit meltdown illustrates, there’s a wide gulf that separates the two positions. Now I believe that talented classical musicians are absolutely deserving of earning far more than most of them are getting around the country, but they’ve run into an economic model that just isn’t able to properly compensate them anymore. And it’s not getting any better. Youth isn’t exactly flocking to classical music as tastes are dumbing down. Schools aren’t helping by cutting arts budgets. Philanthropy is the only solution, and there are signs it’s stretched pretty far. New young philanthropists have to be developed to replace the ageing ones, but it’s not clear that classical music is attracting new wealth. It’s not a pretty picture. By the way, we attended a concert Saturday night in New Orleans of the Louisiana Philharmonic, and it was terrific. The orchestra sounded wonderful, conductor Carlos Miguel Prieto was electric, and the house was packed. There were encores, standing ovations, and even an audience member who mamboed spontaneously (this is New Orleans, after all) as the orchestra played a selection of Leonard Bernstein’s dances. There was a world premiere of Terence Blanchard’s Concerto for Roger Dickerson. And a spectacular performance of Philip Glass’s Violin Concerto No. 2 played by Robert McDuffie, for whom Glass wrote the piece. The LPO model is one solution. They produce a fine product, one that an audience appreciates and relates to. But it’s a draconian solution that requires that the musicians provide the subsidy. Somehow, that doesn’t seem fair. Solving the economic problem of classical music is not easy. If it were, someone would have figured it out already. Perhaps fresh thinking is required.